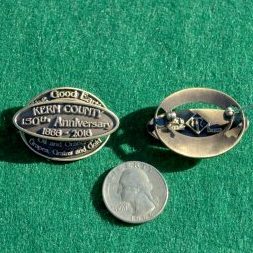 Donate $50 and receive a solid bronze pin specially crafted for us by local artist Charles Topping, to celebrate the 150th Anniversary of the founding of Kern County OR the same type of pin for the 50th Anniversary of the Havilah Historical Society OR a Havilah “T” shirt (if in stock, just state your size), OR at Havilah, CA First County Seat for Kern County baseball cap —- Your $50 gets 1 choice of 1 item , NOT all four items! Just tell us which one you would like when you Donate the $50 or more. THANKS IN ADVANCE!